Guess what, working for minimum wage really blows. Those of us with retail experience on our resumes know that already. Still, writer-director Jameel Khan reminds us once again of the unalloyed joys of dealing with moronic customers and uptight managers in his new film The Strip (trailer here), which opens this Friday in New York. The strip in question is a tacky suburban strip mall anchored by Electri-City, a crummy RadioShack wannabe. This particular store is managed by Glenn, who was seemingly born for retail. It is one of several franchises owned by Kyle Davis’s controlling father. Temporarily working for Glenn, Kyle is being groomed for a management position, with the expectation he will eventually take over his father’s Electri-City mini empire. Naturally though, he is less than sanguine about such a future. The Electri-City co-workers are all suitably colorful, including a ludicrously bad aspiring actor, a good-natured immigrant, and the requisite slacker. They prank each other, drink together, and take abuse from unpleasant customers. Of course, the film’s big questions are blindingly obvious. Will young Kyle meekly submit to his overbearing father or choose to pursue the free-spirited Melissa? Care to take a wild guess? 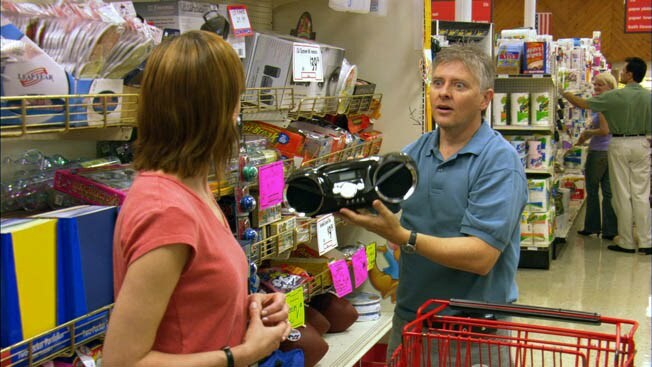 In a role closely akin to his News Radio character, Dave Foley is clearly comfortable as the earnest store manager who seems to have a “kick me” sign permanently affixed to his back. Though Rodney Scott is basically stuck with Kyle Davis’s blandness, but Jenny Wade does make a strong impression as his potential love interest. While The Strip does not have a lot of really big laughs, there are consistent chuckles throughout the film. I t is sort of like watching the pleasantly amusing but not hilarious parts of related films like Clerks, Mall Rats, and Office Space spliced together. The result is admittedly an agreeable film, buoyed by a compulsively upbeat soundtrack composed by John Swihart. Hardly breaking any new cinematic ground, The Strip still has a nice heart and it is amusing in its own likable way. While it will probably prove too modest to make much of a theatrical impact, it should have a long and fruitful ancillary life on DVD and cable. It opens Friday (12/4) at the Quad. Christmas is a time for family, so it is appropriate jazz vocalist Alexis Cole’s new Christmas CD is definitely a family affair. Not only does it feature Cole’s pianist-composer father Mark Finkin, it was directly inspired by his much anticipated college graduation recital. Taking its title from her father’s commencement concert, Cole’s The Greatest Gift presents an eclectic program of seasonal and spiritual fare, the net proceeds from which will go to the non-profit World Bicycle Relief. In a way, Gift also represents the extended family of St. Peter’s, the Manhattan church long identified with the jazz community that Cole has often played. Both St. Peter’s jazz musical director, bassist Ike Sturm, and his vocalist wife Misty Ann contribute to Cole’s Christmas. In addition, trombonist Alan Ferber and guitarist Jesse Lewis are no strangers to the Midtown sanctuary. (Disclosure: I know the Sturms from St. Peter’s Jazz Vespers, where I’m often part of the improvised ushering corps.) Such relationships help explain Gift’s distinctly warm, inviting vibe. Gift actually starts with an instrumental prelude, an upbeat traditional treatment of “Joy to the World,” arranged by bassist Sturm and featuring an almost rock oriented solo from Lewis. Cole then makes a pretty soulful entrance on “Jeanette Isabella/The Call,” augmented by the St. Paul’s Children’s Choir. Indeed, there is a certain R&B-ish influence, especially pronounced on the following “God Rest Ye Merry, Gentlemen,” a duet for Cole and Finkin. There is also similar groove going on in the original closer, “Jesus is the Best Part of Christmas,” which benefits from Don Braden’s funky sax flavorings (but the staged dramatic dialogue is unnecessary). Cole herself arranges one of the highlights of the program, reinventing “Hark the Herald Angels Sing” in a calypso-like cast. Blending the appealing sounds of Braden’s soprano, Ferber’s trombone, and Warren Chasson’s vibes, “Hark” has an infectiously joyous sound that demonstrates jazz and Christmas music can both be fun. While Cole covers many beloved carols, like “What Child is this?” and “Silent Night,” she also includes some less obvious standards, like the spiritual “Rise Up Shepherd and Follow.” In another intriguing arrangement, Cole gives it a pronounced exotic flavor (quite in keeping with the song’s Holy Land setting) adding tabla and tambura to Braden’s soprano. Cole has a rich, strong voice and her charts produce some consistently rewarding music throughout Gift. While she often gives the songs of the season a nice jazz twist, they will always be recognizable and accessible for jazz neophytes. Cole and friends will perform the music of Gift at her CD launch concert this coming Friday evening (12/4 at 8:00), fittingly at St. Peter’s. I have been to Manhattan’s fashionable Koreatown many times to hear jazz gigs, but I have never been harassed there by Korean gangsters. It must be my easy-going demeanor. Of course, I was not frequenting the exclusive room salons that appear to be entirely mobbed up in Michael Kang’s West 32nd (trailer here), now available on DVD. Manhattan’s Koreatown is almost entirely a commercial district, directly adjacent to Herald Square. It is where Jin Ho Chun used to manage the syndicate’s elite salon rooms, before he was gunned down one fateful night, while his lover Suki Kim watched from the window above. She saw it all, but as a “geisha” like salon hostess, she is virtually an indentured servant and knows only a scant bit of English. Attorney John Kim will want to talk to Suki. He has taken on the case of a teenager accused of Jin Ho’s murder. His plan was to sign up a winnable pro bono case to build his tony law firm’s standing in the Asian community, eventually parlaying a courtroom victory into a junior partnership. As counselor Kim investigates the case, he falls in with Mike Juhn, an ambitious Korean mob enforcer who briefly succeeded Jin Ho as manager of the salon rooms, only to be sabotaged by his own impulsiveness. Though ostensibly working his case, Kim spends an awful lot of time hanging with Juhn’s crew in salon rooms, playing Korean drinking games, and wining & dining Lila Lee, the beautiful sister of his client. Nice work if you can get it. Of course, it is also more photogenic than filing briefs. Recognizable from the new Star Trek reboot and TV’s Flashforward, John Cho has a much more terrestrial role in West 32nd as the striving attorney. While he is not terrible in the part, his character is not that swift on the uptake. Though the film’s lead, the bland Cho is largely upstaged by some strong supporting performances, including Jun Kim, who brings the proper mean streets intensity as Juhn. Grace Park is also quite engaging as the concerned sister. The film’s real standout though is the luminous Jane Kim, who conveys a nuanced vulnerability as the distressed Suki. 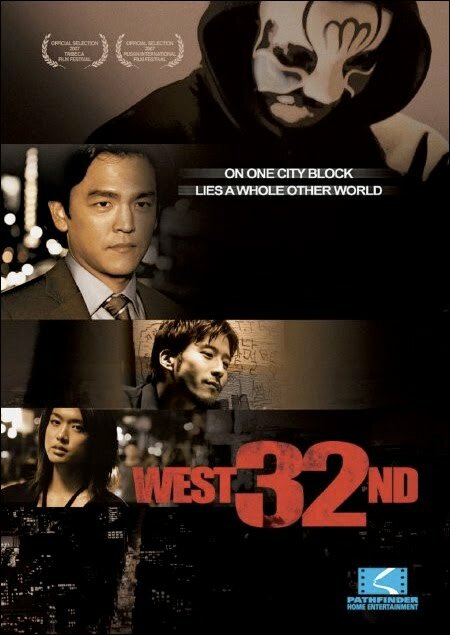 There are a lot of stupid gangster tricks in West 32nd, but it does present an intriguing picture of a supposedly pragmatic Korean crime syndicate. Despite the subservience of the room salon hostesses, West 32nd is not a sexually explicit film (that kind of thing does not go in salons). Yet, it still holds a certain voyeuristic fascination with the illicit gangster lifestyle. At least on DVD (which also includes Heather Park’s music video for “Leave Me to Dream,” a song from the film), it is an entertaining look at underground K-town, with some quite notable supporting turns. Given his untimely death in 1953, there are many great jazz standards that Sinti jazz pioneer Django Reinhardt never had the chance to cover. He never had the occasion to record a set of Christmas carols either, leaving a void the Hot Club of San Francisco (HCSF) recently filled with Hot Club Cool Yule, a Christmas-themed release recorded in the swinging Roma-jazz style developed by Reinhardt during his tenure with French violinist Stéphane Grappelli in legendary Quintette du Hot Club de France. 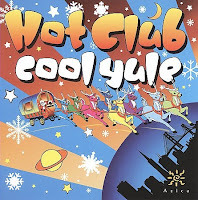 The Hot Club Christmas starts on a distinctly hipsterish note with “Cool Yule,” a high-spirited Steve Allen ditty that was a minor hit for Louis Armstrong, performed with a cheerful playfulness fitting to the holidays. The HCSF then throw a real change-up, launching into “Don Rodolfo,” perhaps the most sophisticated version of “Rudolph the Red-Nosed Reindeer” you will hear this season, recast in a romantic Latin mold, slyly blended with the “Habañera” from Bizet’s Carmen. The HCSF also pays homage to some of the enduringly popular Christmas albums that have become jazz classics in their own right. Vince Guaraldi’s “Skating” theme from the truly beloved A Charlie Brown Christmas special sounds surprisingly compatible with the traditional “Carol of the Bells” in the HCSF’s elegant jazz waltz medley. They also Django-ize “Sugar Rum Cherry,” Duke Ellington and Billy Strayhorn’s swinging adaptation of Tchaikovsky’s “Dance of the Sugar Plum Fairies,” with bassist Clint Baker’s muted trumpet echoing the tonal colors of the Ellington band on the fade-out. Displaying a zesty flair throughout the program, the HCSF again prove they are one of the best Hot Club inspired combos on the scene today. Yule is another good jazz stocking stuffer or office “Secret Santa” gift. Unapologetically fun, it is easily accessible to general listeners, yet also steeped in the jazz tradition. Happy Thanksgiving. 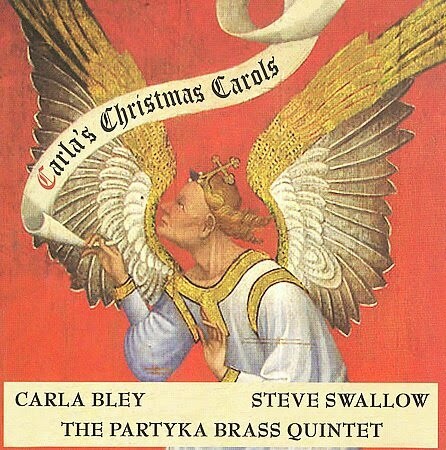 Carla Bley suspects her aspirations for a concert of Christmas music might have cost her at least one gig. Surely, those modernist snobs know by now they made a terrible mistake passing up a program of Christmas carols from the inventive arranger-pianist-bandleader. Indeed, despite her musical adventurousness, Bley has long had an affinity for traditional carols that eventually led to Carla’s Christmas Carols, a distinctive but respectful Christmas-themed release now available on Bley’s WATT label. Often scrupulously straight, Bley’s charts sound as if they were intentionally written to best serve the time-honored carols themselves. Such is definitely the case with the opening “O Tannenbaum,” in which the jazz voicings are only asserted late in the arrangement. Likewise, the warm, relaxed mood of “The Christmas Song” should equally please fans of both Bley and Nat King Cole (still probably the carol’s greatest popularizer). Given this disciplined approach and the burnished sound of the Partyka Brass Quintet, Bley’s Carols will be an especially accessible jazz Christmas album for non-jazz ears. Yet, Bley’s admirers will still be happy to hear her unique musical sensibility very definitely shapes and colors the character of the session. For instance, who else but Bley would pen an original for a Christmas program titled “Hell’s Bells.” While it swings like mad, the glorious trumpets of Tobias Weidinger and Axel Schlosser lend it a vibe akin to the especially rousing carols. Always one to surprise, Bley also gives “Jingle Bells” a New Orleans second-line treatment, ending with a bit of glockenspiel and ompah for punctuation. Of course, Bley also prominently features her longtime partner Steve Swallow, whose decidedly melodic approach to the electric bass largely carries the tune on the simply gorgeous rendition of “O Holy Night.” Though she often dismisses her own playing as “arranger’s piano,” Bley takes several tastefully articulate solos, particularly on the elegant “God Rest Ye Merry Gentlemen, Part Two,” (which logically follows the more boppish brass interplay of “Part One”). It was a most unlikely Oprah book. An eventual winner of the Pulitzer Prize, Cormac McCarthy’s The Road surely had the literary credentials, but lacked the predictable victimization themes favored by the talk show host. Even more improbably, McCarthy’s novel used elements of science fiction, namely the post-apocalyptic setting, to tell its stark tale. 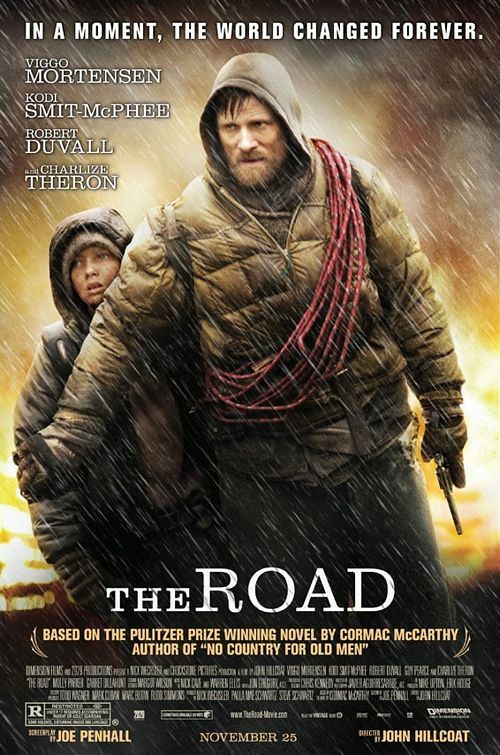 If not typical Oprah Book Club fare, there is definitely a tradition of near-future wasteland genre epics that now continues with John Hillcoat’s big-screen adaption of The Road (trailer here), which finally opens in New York tomorrow. While there was reportedly the proverbial flash of light, the world essentially ended with a whimper, not a bang. Nobody really knows what happens, and it hardly matters now. The Sun has been obscured by a permanent grey haze, killing most vegetation. Infrastructure has been decimated and food is increasingly scarce. Many survivors have resorted to cannibalism to survive. In this unforgiving environment, an unnamed man and his young son are traveling to the coast, in search of a better life. Not willing to endure mere survival, the boy’s mother surrendered to the winter oblivion, leaving them behind. Alone in the world, the man will protect the boy at all costs, but he is clearly not well. They have precious little food remaining, no medicine, and only two bullets left, either for self-defense or for suicide. Still, the man tries to nourish hope in the boy, despite the constant danger represented by white trash cannibal gangs roving the decimated landscape. 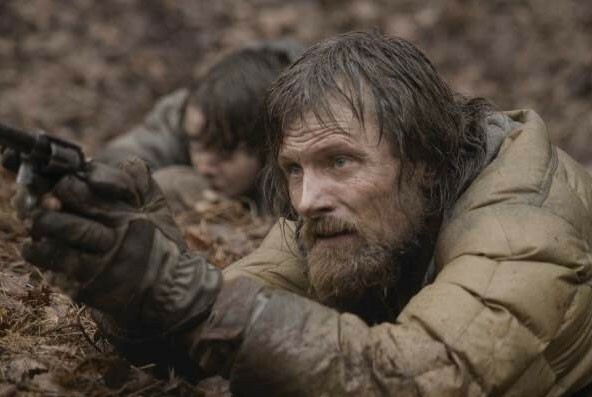 Viggo Mortensen looks convincingly scrawny and sickly as the nameless protagonist. He also has some heartrending scenes with Charlize Theron, appearing in flashbacks as his late wife. Unfortunately, though an apocalypse could certainly be expected to stunt most children’s social development, The Road’s Boy shows zero personality throughout the film. Also, while the great American actor Robert Duvall is quite good as an old man they meet on the road, he is essentially wasted in what amounts to a brief cameo performance. Unquestionably, the most compelling aspect of The Road is its oppressively grim post-apocalyptic milieu. Hillcoat and production designer Chris Kennedy create a fully realized world where the Sun does not shine, the birds never sing, and man is desperately inhumane to his fellow man. Wisely, screenwriter Joe Penhall keeps the cause of the global catastrophe obscure, infusing the film with an unsettling ambiguity that never taxes the audience’s suspension of disbelief with dubious junk science or politically loaded premises (like global warming, nuclear winter, etc). The Road’s bleak vision of the Earth’s near-future death rattle is undeniably powerful, lingering in the conscious well after viewing. However, the film’s on-screen action is pretty standard stuff. Ultimately, The Road offers a decent variation on the end-of-the-world morality play, but it not a dramatic triumph destined for Oscar glory. It opens tomorrow (11/25) at the Landmark Sunshine. The inaugural production of Mercury Theatre had to make a suitably bold statement. In what was then a radical departure from tradition (but has since become conventional), Welles recast Shakespeare’s Julius Caesar in Fascist Europe. Though the Mercury’s production of Caesar: Death of a Dictator was truly groundbreaking, the true star was Brutus, played by company cofounder and artistic director Orson Welles. Though in 1937 the Great Depression continued unabated while Fascism spread across Europe, it was still a heady time for one teenaged actor who witnesses the chaos of Welles’s creative process firsthand in Richard Linklater’s Me and Orson Welles (trailer here), which opens this Wednesday in New York and Los Angeles. British actor Goerge Coulouris had the lead role of Mark Antony. Joseph Cotton had a small part as Publius. Yet the two actors best remembered from Welles’s celebrated Caesar, were of course the director himself, and the young Lucius, who serenaded Brutus in a pivotal late scene. In Linklater’s film, based on the novel by Robert Kaplow, that young actor is a wide-eyed Richard Samuels, who yearns to be part of the New York smart-set. However, working for the tempestuous auteur would be an education in and of itself for the young actor. Welles can be charming, but he is also a demanding taskmaster. Though married, he has quite the roving eye. Yet his genius compensates for his arrogance—at least up to a point. In some of the film’s most insightful scenes, the brash Welles seems to understand on some level that he is just one failure away from a major karma blowback. Given the renowned figures associated with the Mercury, Linklater had a number of casting challenges, but none was greater than the larger-than-life Welles. Yet, in choosing the virtually unknown Christian McKay, he found an actor able to approximate Welles’s incomparable presence, without descending into mere impersonation. Discovered while performing in the very off-off-Broadway production Rosebud: The Lives of Orson Welles, McKay captures the both the cadences and intensity of the Welles so familiar from his classic films. 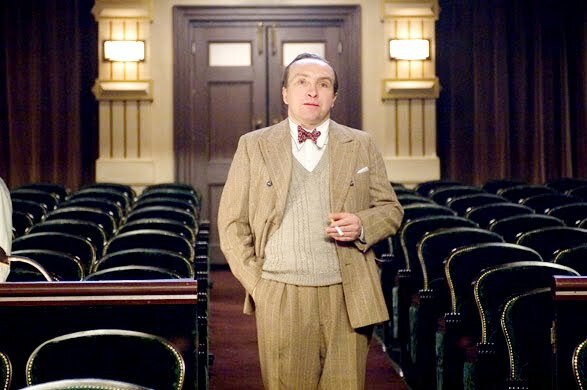 In another tricky bit of casting, Eddie Marsan’s small but important supporting turn as John Houseman, the great British character actor (by way of Hungary), is absolutely pitch-perfect. His Houseman is an island of modest dignity amid the bedlam loosed by Welles’s destructive genius. While it is an even smaller role, Canadian actor James Tupper is also quite convincing as Joseph Cotton. In a way, it is rather appropriate that High School Musical’s Zac Efron would have the lead in a film about the capriciousness of show business. In fact, he is relatively likable as young Samuels. Unfortunately, his love triangle rivalry with Welles for the affections of the director’s cold-bloodedly ambitious assistant Sonja Jones forms the weakest link of the film. In truth, Claire Danes’s Jones is decidedly unsympathetic and far less attractive than Samuels’s prospective girlfriend, Gretta Adler, an aspiring writer played by Zoe Kazan (granddaughter of the great director Elia Kazan). Orson is utterly unlike Linklater’s prior work (including films like School of Rock and Dazed and Confuse d), but he clearly has a keen understanding of Orson Welles’s place in cinema history. He keeps the action moving along fairly jauntily, while paying knowing homage to Welles’s brilliant but checkered career. Production designer Laurence Dorman masterfully recreates 1930’s New York and Jools Holland’s arrangements of vintage swing standards nicely evoke the right period vibe. Indeed, that sense of time and place is one of the handsomely assembled Orson’s greatest strengths. 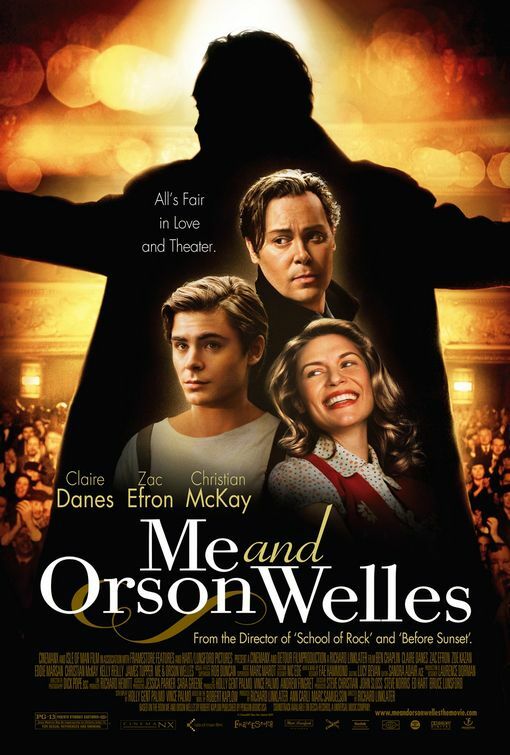 Ultimately, it is an effectively realized valentine to 1930’s Broadway and the mercurial talent of Orson Welles. It opens this Wednesday (11/25) in New York and Los Angeles. While Best Animated Short is often one of the first Oscars awarded, viewers frequently dismiss it as part of the ceremony’s typically tedious first hour. Yet, it can be tremendously significant for the nominated filmmakers. After all, Shane Acker was able to parlay his Oscar nominated short 9 into a full length theatrical feature. The Academy has just released a shortlist of ten animated shorts, winnowed down from thirty-seven qualifying films. Though the pleasant Partly Cloudy probably has a lock a nomination coming from perennial Oscar favorite Pixar, the rest of the field looks wide open. Two films that made the list deserve special consideration. Canadian Cordell Barker’s animated Runaway (trailer here) might look light-hearted and whimsical, but at its core, it might be the most gleefully macabre film of the shortlist. 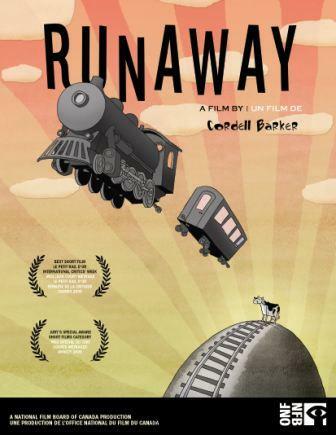 Nine minutes of madcap humor, Runaway involves a cow, an out of control train, a little fur ball of a dog, and an engineer’s assistant trying desperately to save the day. It all hurtles down the track to the propulsive rhythm of Benoit Charest’s soundtrack. Best known for the score of Silvain Chomet’s The Triplets of Belleville, Charest’s music for Runaway has a similar spirit, sounding something like a mutated form of early hot jazz on some serious acid. Charest also brought in many of the same jazz musicians who recorded Triplets, including the drummer Jim Doxas and his saxophonist brother Chet, both of whom have played with the highly regarded Canadian jazz pianist Oliver Jones. Music also factors prominently in Eddie White and Ari Gibson’s The Cat Piano, but in this feline fable, jazz is seen but not really heard, with Benjamin Speed’s soundtrack effectively evoking a once-upon-a-time vibe. 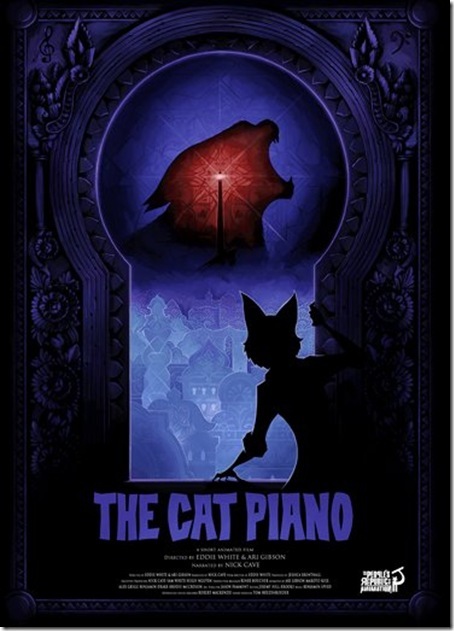 Piano is a noir fairy tale, in which an evil force kidnaps the jazz chanteuses, crooners, and street buskers of an exotic city of cats that was once distinguished by its thriving nightlife. Eventually the narrator, a reclusive writer voiced by Bad Seeds frontman Nick Cave, tracks the missing musical cats to the infernal title contraption. Runaway is an inspired act of lunacy, whereas Piano is stylishly moody. Both would be worthy nominees and even ultimate winners of the Oscar for Best Animated Short. Members of the Academy’s animation division will be screening the shortlist films in January, and the final nominations will be announced on February 2nd. As a former Soviet client state, the Somali people have again looked to Russia for economic assistance rebuilding their troubled country. Unfortunately, there is no functional governing body to keep the peace and administer any aid that could be offered. Essentially, Somalia exists in a state of anarchy, which allows terrorism and piracy to flourish unchecked. Indeed, the two are closely related, as Vladimir Sinelnikov reveals in his documentary investigation The Black Spot, directed by Vadim Ostrovsky, which screened last night as part of the ninth annual Russian Film Week in New York. The issue of Somali piracy is not merely academic for Russia. The Ukrainian owner Merchant Vessel Faina had a Russian captain and first officer when it was hijacked off the coast of Kenya. Ultimately, the crew was ransomed, but not before the reportedly stress-induced death of the captain, Vladimir Kolobkov. Obviously, piracy, kidnapping, and in some cases murder, violate every conceivable concept of international law, imperiling merchant seamen around the world. However, Sinelnikov makes a compelling argument such piracy represents a graver global menace. He points to Somalia’s strategic location with respect to the Gulf of Aden and the international shipping routes for oil. Sinelnikov suggests it may well only be a matter of time before pirates try to choke off the world’s oil supply or threaten the region with an environmentally catastrophic oil spill. Of course, the biggest question is where does the ransom money go? As Sinelnikov makes clear, the pirates themselves live desperately mean existences. Connecting the dots, he follows the money to shadowy representatives of Somalia’s tribal leaders and Islamist terrorist groups, including perhaps Al-Qaeda. 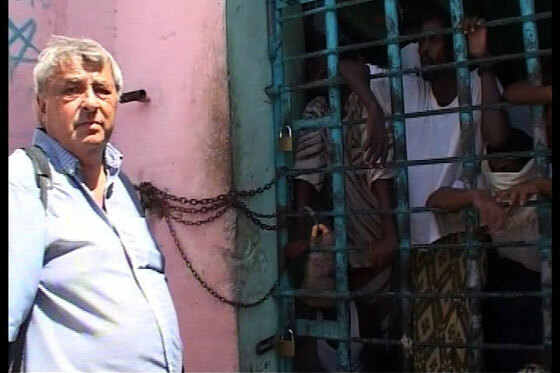 In fact, Sinelnikov and his crew were very much in harm’s way while filming in Somalia, at one time witnessing a shootout between their security escorts and a contingent of bandit-terrorists. However, the film’s post-script about the hijacking of the MV Arctic Sea (presumably somewhere in the Baltic Sea) opens a host of additional speculations that somewhat cloud Spot’s overall contentions. Though originally produced for Russian television, Sinelnikov is hardly optimistic about the film’s chances to actually airing there in its present form. That is unfortunate, because Spot is quite provocative, presenting some eye-opening information and making some genuinely frightening connections. While Spot has more of the look of an in-depth news magazine special than a feature film, it is a very interesting journalistic endeavor. It nicely compliments the dramatic features of this year’s Russian Film Week, which concludes Sunday with a full day of screenings, including Pete on His Way to Heaven and Gift to Stalin. 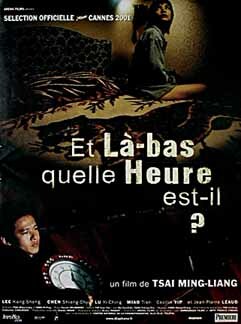 Faces of Tsai Ming-liang: What Time is it There? As a Taiwanese director whose films have often been French co-productions, Tsai Ming-liang is likely well aware of the seven hour time difference between Taipei and Paris. This fact also becomes significant to a Taiwanese street vendor who compulsively starts setting clocks to Parisian time in Tsai Ming-liang’s What Time is it There? which concludes the Asia Society’s Faces of Tsai Ming-liang retrospective this Saturday. Tsai stalwart Lee Kang-sheng again returns as the director’s pseudo-alter-ego Hsaio-kang, who now hawks watches on the streets of Taipei. Hsaio-kang’s father has recently passed away and his mother is not coping well. One day, an attractive stranger on her way to Paris offers to buy Hsiao-kang’s own watch. Though he initially refuses, claiming his father’s death would make it “unlucky,” her persistence wears him down. After all, he is a loser and she is a beautiful woman. Although their connection is fleeting at best, Hsiao becomes preoccupied with the woman now spending a year in the French capitol. Oddly, his obsession manifests itself in a need to set clocks to Parisian time. Meanwhile in Paris, the assertive young woman is suddenly shy and tentative in the foreign land. In a nod to the French New Wave, as Hsiao-kang watches François Truffaut’s 400 Blows, the woman has a brief encounter with its star, Jean-Pierre Léaud in a Parisian cemetery. 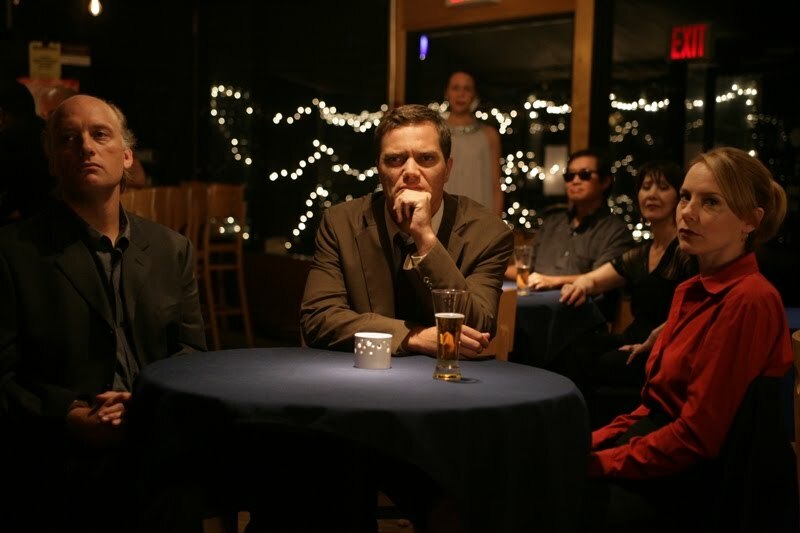 Indeed, synchronicity is critical to Time, as when the three principal characters have similar but entirely unrelated experiences late in the film. 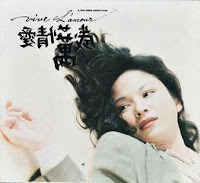 Time’s ending also seems to deliberately echo that of Tsai’s international breakout film Vive L’Amour, until sly bit of magical realism breaks the pattern. Tsai might be a demanding filmmaker, but he certainly knows how to end a picture. While Tsai often depicts his characters in uncomfortable private moments, the penchant is especially pronounced in Time, which features instances of auto-eroticism, urination, and vomiting. In truth, these scenes are not graphically rendered—they simply feel voyeuristically intrusive. Yet, there is still a distinctly humanistic quality in Tsai’s work, deeply emphasizing with his characters while examining their suffering in unsparing detail. Chen Shiang-chyi is quite mesmerizing as the object of Hsiao-kang’s desire. However, Lee Kang-sheng’s weird ac ting out as Hsaio-kang might be difficult for audiences to relate to if they have not seen some of his past incarnations in earlier Tsai films. Still, the honest directness of Chen’s work can be appreciated by any viewer. Given the extremely tenuous nature of the relationships in Time and the director’s languid pacing, it is definitely a film for discriminating cineastes. It is still undeniably the work of a genuine auteur, crafting pictures with their own rough beauty. It screens tomorrow (11/21) following The Hole (arguably Tsai’s most accessible picture), as the Asia Society concludes their Faces of Tsai Ming-liang retrospective series. Japan’s decade-long economic downturn has one advantage. Every contemporary film and novel created during that period now feels timely to the rest of the world. 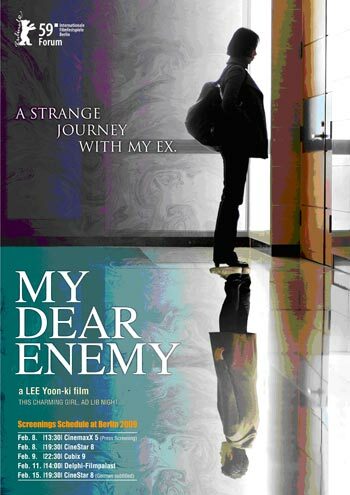 Such is the case with Lee Yoon-ki’s Korean adaptation of Japanese author Taira Azuko’s novelette, My Dear Enemy (trailer here), which starts a week-long run today at the MoMA. Set in Lee’s Seoul rather than Azuko’s Tokyo, the Korean economy has done no favors for single thirty-something Hee-su. As Enemy opens, she needs money rather badly, so when she gets a line on the slacker ex-boyfriend she once loaned the equivalent of $3,500, she moves in to collect the old debt. Of course, the preternaturally irresponsible Byung-woon does not have two cents to his name, but he promises to raise the money from his lucky friends. However, he insists Hee-su come along for the ride. For the rest of the day, Hee-su has the awkward experience of meeting a parade of Byung-woon’s ex-girlfriends, many of whom seem rather out of his league, like the well-heeled hostess played by Oh Ji-eun. However, they all seem willing to float Byung-woon yet another loan to retire his debt with Hee-su, while he seems to take perverse enjoyment in the asking. Naturally, their mission encounters inevitable detours along the way, as well as a host of quirky personality types. There are also hints of the old magic between the former lovers, as well as plenty of fresh reminders of their incompatibility. Hee-su and Byung-woon spend nearly the entire film forced together in confined spaces, like her car, the subway, or strange apartments. There is big-time history between them, but the audience only learns the broad strokes of their failed relationship. Jeon Do-yeon and Ha Jung-woo are absolutely convincing as the mismatched exes (Hee-su and Byung-woon, respectively), subtly conveying the chemistry which initially brought them together, as well as the frictions and annoyances that ultimately drove them apart. A rising star who won best actress honors at the 2007 Cannes Festival (for Secret Sunshine), Jeon’s finely nuanced performance is particularly memorable, expressing the mounting desperation as well as the considerable regrets of the normally reserved Hee-su. Lee Yoon-ki is a sensitive director, who lovingly frames his shots. He lets each scene play out at a natural, unhurried pace, but the results never f eel sluggish or self-indulgent. He also gets a big assist from Kim Jeong-beom’s sprightly swing-oriented jazz soundtrack, which prevents the film’s momentum from ever dragging. While Enemy might be small in scope, its “deal with the ex” storyline has a universal appeal. It is a handsomely produced film, featuring an especially honest and emotionally direct performance by Jeon Do-yeon. It opens today (11/20) as part of MoMA’s ongoing ContemporAsian film series. It seems a renaissance of sorts is brewing for Pedro Almodóvar’s breakout film Women on the Verge of a Nervous Breakdown. Rumor has it a book musical adaptation is on the fast-track to Broadway. Almodóvar also resurrects Verge as the recognizable film within his new film, the noirish drama Broken Embraces (trailer here), which opens in New York this Friday. Harry Caine could easily be a character in a Cornell Woolrich novel. That is because Harry Caine does not really exist. He was once the famous director Mateo Blanco, who wrote scripts under the Caine pseudonym. When a traumatic accident led to his blindness, Blanco the director essentially died, with Caine the screenwriter assuming his place. Caine might be blind, but he still has an eye for beautiful women and though he can no longer direct, he still has an appreciation for cinema, frequently listening to art-house classics with Diego, the son of his agent Judit Garcia. Not one to dwell on the past, Caine rebuffs the interview requests of Ray X, an aspiring documentarian and the son of an old acquaintance. However, as Caine finds himself nursing Diego back to health following an incident with a laced drink, he starts to open up to younger man, telling his story in a series of flashbacks. Mateo Blanco was the writer and director of Girls and Suitcases. It starred Lena Rivero, the mistress of industrialist Ernesto Martel (Ray X’s father), who financed the picture. Garcia, who had once had a fling with Blanco, was his trusted production manager. Basically, it was a classic film noir situation, virtually guaranteed to breed jealousy and betrayal. Not coincidentally, Suitcases bears a strong resemblance to Verge, except it is awful, deliberately assembled with Blanco’s worst takes by a vengeful Martel. It is an oddly amusing exercise in self-referential gamesmanship, but only one of many cinematic pastiches in Broken. For instance, Almodóvar also frequently nods to the post-war Italian neo-realists, like Rossellini, whose Viaggio in Italia moves the furtive lovers to tears as they watch it in each others arms. In fact, Broken’s key art appears to be modeled after the classic posters of post-war Italian cinema. Dark and lush, Rodrigo Prieto’s ominously gauzy cinematography is arguably more reminiscent of Hitchcock’s color films of the 1950’s and 1960’s then 1940’s noir. Though Broken often has a noir vibe, whenever the film approaches genuine film noir territory, Almodóvar deliberately pulls back, undercutting the thriller aspects. Aside from a few key scenes, the violence of Broken is emotional rather than physical in nature. Yet, it is suffused with a strange romanticism for cinema. Indeed, the moving image, be it classic films or videotape of his fateful accident, might well be more powerful than real life for Caine—representing constant and enduring forces inexorably shaping his life. Unlike the dramatically extroverted Verge, Broken is a more self-consciously intellectual film. Yet, Lluis Homar is quite riveting as Caine/Blanco, finding intriguing nuances throughout each stage of his cha racter’s development. In a sense, Penelope Cruz is also perfectly cast as Lena, an austere beauty who remains something of a cipher throughout the film. Broken is a moody love-letter to cinema. While it might come across as a bit cold in comparison to some of Almodóvar’s more hot-blooded films, it is ultimately a very satisfying twist on the portrait-of-the-filmmaker-as-a-suffering-artist subgenre of art film. It opens tomorrow at the Lincoln Plaza and Sunshine Cinemas. The film noir world of railway sleeper cars and smoky jazz clubs might sound like a throwback to the 1940’s. However, reluctant protagonist John Rosow is definitely a creature of the world in which we now live. Like any good anti-hero, Rosow is drinking himself into oblivion, but his angst stems from the tragic events of September 11th in Noah Buschel’s oh-so-noir The Missing Person (trailer here), which opens tomorrow in New York. Formerly an NYPD detective, Rosow is now a low-rent Chicago P.I., who only wants to sleep off his latest bender. Unfortunately his phone will not leave him in peace. For inexplicable reasons, a power attorney is determined to hire him for a tail job. Before he fully realizes it, Miss Charley, his client’s frosty assistant, has bundled him onto an overnight express train to Los Angeles with an envelope of expense money and a heap of contempt. The first two thirds of Missing often veer perilously close to self-parody, particularly during Rosow’s over-the-top voiceovers. However, the film offers a third act surprise, finding unexpected significance in its post-9/11 premise. It turns out Harold Fulmer, Rosow’s quarry, was one of the World Trade Center’s “missing” who took advantage of the tragedy to abandon his wife. Fulmer hardly left her in a financial lurch though. In fact, he seems to be a good person engaged in selfless work, despite the sketchiness of his associates. He is even a passionate jazz listener, so he cannot be all bad. Still, Rosow has his own reasons for identifying with Mrs. Fulmer that also involve that hallowed ground in Lower Manhattan. Following in the tradition of many classic film noirs, Missing effectively employs the blue notes of jazz to evoke the moodiness of its transient, nocturnal world. Making a welcome cameo appearance, tenor saxophonist Joe Lovano is seen and heard playing in a New York night club. Missing also makes effective use of classic Bud Powell recordings, like “Glass Enclosure,” of which Fulmer is a professed fan. While Missing’s shrewdly selected music might sparkle, it is one of the most deliberately dingy looking films you can ever hope to see on screen. If nothing else, Ryan Samuel’s cinematography makes Roso w’s life look convincingly grim. To his credit, the granite-faced Michael Shannon never betrays a hint of irony as the lowlife gumshoe. He also has some nice screen chemistry Amy Ryan as Miss Charley. Several of the other supporting players are more than a little stiff though, further accentuating the film’s stylistic excesses. Turning on a dime from highly exaggerated noir to existential contemporary drama, Missing is a film with a lot of ragged edges. However, it handles the 9/11story elements with proper respect. You also have to give due props to any new film exhibiting a jazz aesthetic. An odd blend of hardboiled attitude and apparently genuine human empathy, Missing has its moments for connoisseurs of the film noir genre. Yet, it will likely prove far too stylized and idiosyncratic for general audiences. It opens tomorrow at the Village East. 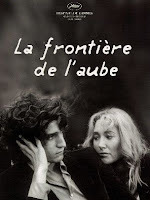 French auteur Philippe Garrel’s international following might stem as much from a voyeuristic fascination with his well-documented personal tribulations as from a regard for his critically acclaimed films. Indeed, his ill-fated relationship with pop icon Nico reverberates throughout much of his later work, including his most recent film, Frontier of Dawn (trailer here), an official selection of the 2008 Cannes Film Festival that screens this weekend at Anthology Film Archives. It is always hard to untangle Garrel from his protagonists, especially with his son Louis Garrel cast as the lead. In Dawn, the younger Garrel plays François, a somewhat immature photographer assigned to shoot Carole Weissman, a beautiful but profoundly troubled actress. Though camera-shy, she easily seduces François, initiating a tempestuous romance. Weissman is terrible girlfriend material for a number of reasons—the most practical being her marriage to another actor she hardly knows and rarely sees. She also happens to be an alcoholic and a relentless game-player, who proceeds to torture François, constantly pushing him away, only to reel him back in. Rapidly degenerating mentally, Weissman is eventually institutionalized, where she undergoes electroshock therapy in a scene directly inspired by director Garrel’s own notorious experiences. Weissman’s self-destructive tendencies culminate in a long dark night of the soul, but even in death François is not free of her manipulations. Engaged to another fragile (but psychologically healthier) woman, François starts seeing Weissman’s apparition, in Ophelia-like funereal dress, literally through the looking glass. Dawn is a strange film in many ways. While it has the unsparing intimacy that marks Garrel’s oeuvre, it takes an unexpected late turn into gothic territory, capped off by a finale sure to induce double-takes. There is also a sporadic Goddard-esque randomness to the film, as when François declares his Judaism to a drunken anti-Semite in complete dramatic non-sequitur. How this revelation is meant to inform our reading of the film remains obscure. Still, despite the occasional stylistic indulgence, Dawn is a starkly beautiful film. William Lubtchansky’s black and white cinematography is appropriately haunting, while the classical soundtrack composed by Jean-Claude Vannier and performed by jazz violinist Didier Lockwood sets a truly eerie tone, effectively amplifying the turbulent emotions on-screen. Laura Smet’s ethereal beauty, simultaneously alluring and forbidding, perfectly fits the troubled Weissman. She is also quite scary (in more ways than one), convincingly portraying her character’s preci pitous mental dissolution. Louis Garrel also delivers one of his better screen performances, bringing believable dimension to an intentionally weak, malleable character. Together, they look right but feel wrong. Dawn is a weirdly elegant film that might even alienate some of Garrel’s admirer’s with its supernatural overtones. Yet it might be his most accessible for the same reasons. Though deemed a revival engagement by Anthology Film Archives, it will be a first run film to most New Yorkers, having previously had a very limited theatrical run, in Brooklyn. Unsettling but affecting, it screens Friday (11/20) through Sunday (11/22) at AFA. Taiwan Y2K: It’s not exactly the end of the world, but nobody feels fine. The government has established wide quarantine areas following the outbreak of the so-called “Taiwan Fever.” The water is unsafe, the weather is awful, and the few holdouts refusing to evacuate their old apartments are profoundly lonely. 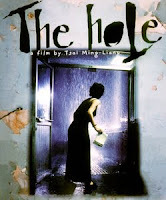 Such is Taiwan in the year 2000 as envisioned by Tsai Ming-liang in his 1997 film, The Hole, which screens at the Asia Society as part of their Faces of Tsai Ming-liang retrospective series. In addition to the scarcity of potable water and basic sanitation, an unnamed woman is plagued by a series of persistent leaks flowing down into her apartment. When a plumber investigates, he leaves a rather conspicuous hole in the middle of her ceiling, which one of her last remaining neighbors quickly vomits into. Evidently, it is hard to find good help in the Hot Zone. The man upstairs and the woman downstairs hardly ever talk, despite being the nearly the last people left in the neighborhood. He runs a convenience store located in what appears to be a self-storage locker, where he feeds a stray cat and frequently gets drunk. She stockpiles toilet paper, battling like Sisyphus against the torrential leaks. Indeed, life is grim for the downstairs woman, and getting steadily worse. However, there is temporary respite in Tsai’s dark, dank world that comes through the power of fantasy and the music of Grace Chang. Born on the Mainland, Hong Kong actress and singer Chang had a vocal style that should please fans of Rosemary Clooney and Peggy Lee. Her songs, “Oh, Calypso,” “Dragon Lady,” “I Want Your Love,” “Achoo Cha-Cha,” and “I Don’t Care Who You Are” accompany the sweetly surreal dance numbers featuring the woman upstairs, sometimes fronting a company of glamorous ladies in sequined evening dresses. Call the exuberant choreography and lip-synching bizarre or even goofy, but it comes as a welcome relief, leavening the despair of Tsai’s gloomy vision of the future. They also happen to be really swinging pop songs. Hole reunites Yang Kuei-Mei and Lee Kang-sheng from Vive L’Amour as the woman downstairs and her upstairs neighbor. Once again, the audience sees more than enough of Lee in his tighty-whities, but he i s quite compelling as the socially awkward man. Still, Yang steals the show again, both as the emotionally exhausted woman downstairs and as the alluring chanteuse in the musical interludes. Originally commissioned for French television’s 2000: As Seen By, a series of short films inspired by the then impending turn of the Millennium, the feature length Hole paints a dreary picture of the future, yet it ends on a transcendently optimistic note. Following a strikingly framed conclusion, Tsai’s end titles declare: “In the year 2000, we are grateful that we still have Grace Chang’s songs to comfort us,” which beautifully encapsulates the spirit of the film. Arguably more accessible to general audiences than his award-winning Vive, due to its futuristic themes and wild musical sequences, the strange and compelling Hole screens at the Asia Society on Saturday (11/21), the final day of their ongoing Tsai retrospective. It was like the Siege of Troy without the big wooden horse. Well-known to Chinese audiences from the Fourteenth Century novel, The Romance of the Three Kingdoms, The Battle of Red Cliff offered John Woo a huge, sprawling canvas for his first Asian produced film since answering Hollywood’s call in the early 1990’s. 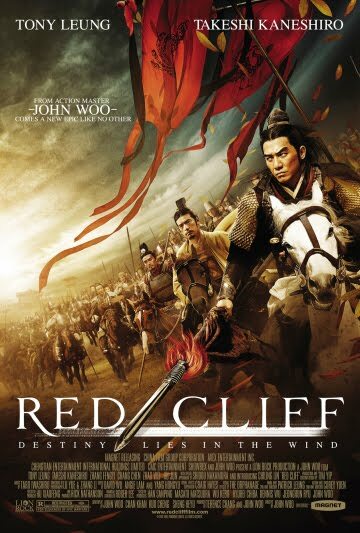 Featuring sweeping battle scenes, courtly intrigue, and yes, plenty of doves, Woo applies his signature action style to the 208 AD campaign in Red Cliff (trailer here), which opens tomorrow in New York. Though originally produced and released in Asian markets as two full movies clocking in at over five hours in total, the international edition of Cliff playing in American theaters has been edited into a mere two-and-a-half hour stand-alone film. While much of the historical background and perhaps a fair amount of character development were cut, the abridged version overflows with epic combat sequences, out-Bravehearting Braveheart. In the waning days of the Han Dynasty, Prime Minister Cao Cao bullies the weak young Emperor into declaring war against Liu Bei’s peaceful Xu kingdom in the west and Sun Quan’s prosperous Wu kingdom to the South. Following a costly defeat, Liu’s strategist Zhuge Liang forges an uneasy alliance with Sun Quan by appealing to his wise Viceroy Zhou Yu, who has his own reasons for battling Cao Cao. 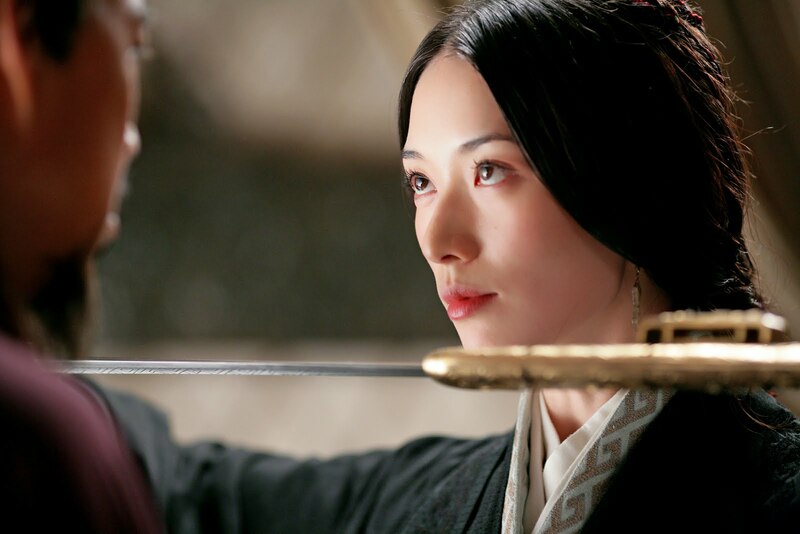 His wife Xiao Qiao is Red Cliff’s Helen of Troy, whose beauty has haunted Cao Cao for years. While the CGI can be a bit conspicuous at times, Woo invests the action with grit and vigor. He stages several enormously ambitious full-scale battles worthy of Cecil B. DeMille, complete with naval skirmishes, charging cavalry, and blizzards of arrows. Yet it is the gravity defying martial arts fight choreography that really delivers the goods. As Zhou Yu, Tony Leung, the star of Woo’s breakout hit Hard Boiled, brings the right heroic screen presence to credibly serve as the action lead, without being overshadowed by the considerable spectacle constantly enveloping him. While many of the supporting players are largely lost in the editing shuffle (including the noble leaders of the allied provinces), Leung is nicely counterbalanc ed by Takeshi Kaneshiro as the mystical Zhuge (who turns out to be a walking second century Farmer’s Almanac). Chiling Lin also is quite effective as the beautiful Xiao Qiao, projecting a sense of strength and compassion that helps to humanize a story almost entirely dominated by warfare. Red Cliff is probably best appreciated in its intended, unexpurgated form. Still, the American cut remains a meticulously produced historical action film that compares highly favorably with recent competing martial arts fare. Basically all about fighting, Cliff is frankly just a sheer blast to watch. It opens tomorrow (11/18) at the Sunshine Cinema. Great political power in and of itself does not seem to interest Alexander Sokurov. In his thematically related “Great Leaders” film series, the Russian director has instead focused on titanic historical figures in the twilight of their supremacy. Previously, Sokurov portrayed Hitler and Lenin as irredeemably warped by their madness and craven appetite for control over others (in Molloch and Taurus respectively). Ironically, the Emperor Shōwa (better known in the West as Hirohito) emerges as a much more human figure, despite the divine status he has yet to renounce in Sokurov’s The Sun (trailer here), the third installment of his projected tetralogy, which opens at Film Forum this Wednesday. The Emperor has never buttoned his shirt or opened a door on his own. Closely attended by servants since birth, he seems naively ignorant of worldly matters. Arguably, he is also a war criminal. With the arrival of the American occupational force, a reckoning would seem inevitable, yet it is unclear whether the sheltered Emperor fully understands his precarious position. The Sun probably could not have been made by a Japanese filmmaker. Serving as his own cinematographer, Sokurov creates a dour, ethereal world of gauzy grays and sepia tones that eerily reflects Hirohito’s alienation from conventional life. Twitchy and awkward, the Emperor hardly cuts an imperial figure. Indeed Japanese actor Issey Ogata gives a bold performance in more ways than one, vividly humanizing and humbling an iconic national figure. Yet in contrast to Sokurov’s other subjects, the noble-born Hirohito actually has a capacity for genuine nobility and perhaps even redemption. 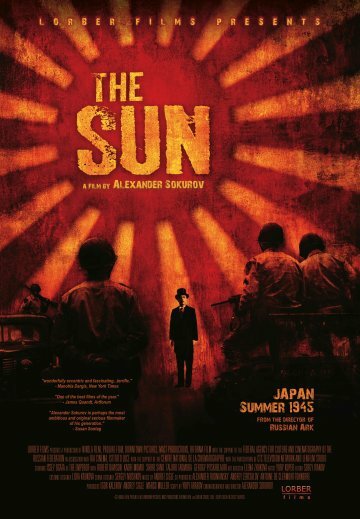 Chronicling the days leading up to Hirohito’s great renunciation, Sun might seem like an uneventful film on the surface. 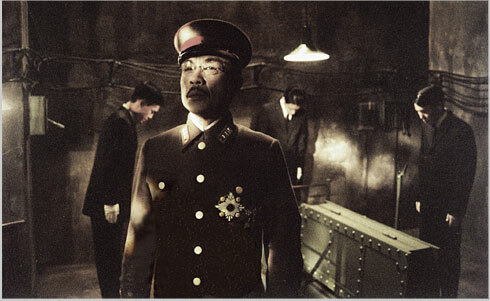 Yet Sokurov and the riveting Ogata compellingly convey the ostensive leader’s tremendous internal drama. Especially intriguing are Hirohito’s tense meetings with Gen. Douglas MacArthur, the commander of the American occupation, which would directly shape the future of the Japanese nation. Though not exactly a perfect likeness, Robert Dawson at least projects the right military bearing and mannerisms as the General, conspicuously contrasting with the reserved Emperor. Do Sokurov and screenwriter Yury Arabov let Hirohito off too easily for his complicity in Japanese war crimes? Perhaps. Yet they present an engrossing study of a flawed man, unexpectedly rising to the occasion at critical juncture in history. Unlike the monstrous Lenin and Hitler, Sokurov’s Hirohito truly cares more for the welfare of his people than his own interests. In fact, it might be easier for him to relate to his country on a macro level than to interact with people on an individual plane, including even his wife. Filmed with stately deliberation, The Sun is a thoughtful examination of power and nobility. Though it might be considered controversial in Japan for depicting the Emperor Shōwa as mortal man of slight stature and an almost childlike demeanor, The Sun is in fact a highly sympathetic cinematic rendering of Hirohito and his proud countrymen. It opens Wednesday (11/18) at Film Forum. Their cinematography marks some of Hollywood’s most (and least) celebrated motion pictures, yet their first collaboration as film students might be even more historically significant. Before Laszlo Kovacs and Vilmos Zsigmond filmed watershed movies of the 1970’s, like Easy Rider, Deliverance, Paper Moon, and Close Encounters of the Third Kind, the master Hungarian cinematographers captured on film a historical record of the Soviet Army brutally repressing the 1956 Hungarian Revolution. Now their dramatic lives and work are profiled in fellow cinematographer James Chressanthis’s feature directorial debut, No Subtitles Necessary: Laszlo & Vilmos (trailer here), an official selection of the 2008 Cannes Film Festival which airs tomorrow night in most markets on PBS’s Independent Lens. Following the Soviet invasion, Kovacs and Zsigmond miraculously smuggled their footage out of the country in an unlikely escape that became the stuff of Hollywood legend. Amazingly, Kovacs actually clandestinely returned to Hungary later to sneak out loved ones, leaving an increasingly anxious Zsigmond waiting near the border. Though different in temperament, the two men are constantly referred to as brothers in spirit throughout Subtitles. While Kovacs was described as a ladies’ man, Zsigmond emerges as a bit shier and slightly more neurotic. Yet, both would do anything for the shot on the early exploitation films they cut their teeth on. Then one day, Kovacs landed yet another biker movie: Easy Rider. From that point forward, Kovacs and Zsigmond became the d.p.’s of choice for the generation of filmmakers sometimes labeled “the American New Wave,” including Dennis Hopper, Peter Bogdanovich, Hal Ashby, Robert Altman, Martin Scorsese, and Bob Rafelson. Throughout the film, both men come across as highly regarded and genuinely well liked in an industry not known for fostering camaraderie. Many of the directors and actors they worked with, notably including Jon Voigt and Dennis Hopper, offer some engaging reminiscences. Bogdanovich, both a film historian and a director (who worked with Kovacs on Targets, Paper Moon and the ill-fated At Long Last Love), offers some particularly insightful commentary. As one would hope for a documentary about cinematographers, directed by one of their peers, Subtitles has a very vital, cinematic look. Give credit to cinematographer Anka Malatynska just for accepting such a daunting assignment. Chressanthis also nicely explains his subjects’ distinctive mastery of light, as well as their tireless work to promote recognition of cinematography as a creative discipline in its own right. Clearly, Kovacs and Zsigmond were comfortable opening up to a colleague, speaking frankly about their person al and professional challenges. Though Kovacs passed away in 2007, there are still ample interview segments with him, while seeing Zsigmond without his lifelong friend adds poignancy to what could have easily been a Hollywood-style celebration of triumph over adversity. Indeed, Subtitles is truly a cinematographer’s film. It looks great and will foster an increased appreciation of the director of photography in general with its many clips of the classic films shot by Kovacs and Zsigmond. It airs on Independent Lens tomorrow night (11/17) at 10:00 on New York’s Thirteen. Petya Makarov lives in a provincial town actually prospering under Stalin’s rule. That is because it services the newly built gulag nearby. Though largely oblivious of such economic concerns, Makarov is probably his community’s most dedicated Communist. He is also the village idiot. It is not a bad life for the Kandalaksha villagers, as long as they do not look over the fence in Nikolai Dostal’s Pete on the Way to Heaven, which screens during the 2009 Russian Film Week in New York. The year is 1953 and Stalin is not long for the world he terrorized. While Makarov’s fellow villagers might be smarter and worldlier than he, they will be equally devastated by impending demise. Makarov however, is a true believer unencumbered by fear or self-deception. In his enthusiasm, he has adopted the role of militia inspector, enforcing traffic regulations on a volunteer basis. He has the hat but pines for the gun. Wisely though, the local authorities only allow him a wooden surrogate. There is ugliness to see in the village, for those who bother to look. The Colonel in charge of the work camp personally supplies much of it. Cruel and virulently anti-Semitic, he is married to the attractive (and much younger) director of the local clinic. She seems like a reasonable person, but her advances understandably unnerve her Jewish colleague. The guileless Makarov can wholeheartedly cast his ballot for the “Communist-Nonpartisan” candidate without recognizing the inherent contradiction. The rest of town has no such excuse. They are living life looking the other way. Based on the glaring foreshadowing of the title, this corrosive environment may well end up costing Makarov dearly. Egor Pavlov is the perfect picture of innocence, but never gets too cute or unrealistically noble as the dimwitted protagonist. Svetlana Timofeyeva-Letunovskaya displays an intriguing screen presence as the Colonel’s wife and Aleksandr Korshunov also delivers a charismatic supporting turn as Kon ovalov, the village’s one decent (and relatively proletarian) authority figure. However, most of their fellow villagers are rather interchangeable and undistinguished. Unfortunately, Heaven tarries far too long with the rather unexceptional comings and goings of their daily village lives. Ultimately, Heaven is a tragedy several times over. While the central heartbreak unfolds before our eyes, it is important to remember far greater horrors occur off-screen—out-of-sight and out-of-mind for the good Kandalaksha townspeople. Though it meanders a bit at times, Heaven’s fascinating premise and its convincing sense of time and place make it a film worth seeking out. It screens again next Sunday (11/22) at the Millennium Theater. It is 1956 and Khrushchev’s de-Stalinization campaign is under way. Religion is still strictly verboten though, which is why the authorities of provincial Russian town are so alarmed when a genuine miracle occurs in their midst. Both religious and secular faiths are tested in Aleksandr Proshkin’s The Miracle, which screens during the 2009 Russian Film Week in New York City. Based on an incident known as “The Standing of Zoya,” the miracle in question happens to a quite unlikely subject. Zoya is a dogmatic Young Communist and an ardent atheist, who forces her long suffering mother to remove all her icons, except for St. Nicholas. When her lover is a no-show for her birthday party, Zoya grabs St. Nicholas to serve as her ironic slow dance partner. In a mysterious flash of light, Zoya is suddenly transformed into an immovable chisel-breaking statue. As Miracle makes crystal clear, there were definite limits to Khrushchev’s liberalization. In no way would the Communist Party tolerate any form of religious revival inspired by Zoya. At first, an alcoholic reporter is dispatched to debunk the story. Unfortunately, the problem with degenerate journalists is that they recognize when they are being played. Overtures are then made to an Orthodox priest to discourage miraculous thinking amongst his remaining flock. Eventually, Khrushchev himself tackles the situation personally when his plane is forced to make an emergency landing at the nearby military airfield. Miracle has a great deal of both faith and skepticism. Frankly, it does not present an especially flattering portrait of Russian Orthodox clergy. Yet the miracle is presented matter-of-factly, without any did-it-or-didn’t hedging after the fact. Miracle also acts as a corrective to any misinformed romanticism of the Communist era. Even during Khrushchev’s Thaw, pervasive propaganda and religious persecution were firmly established Communist policy. Nicely balancing dissipation and charm, Konstantin Khabensky hits the right notes as Nikolai Artemyev, the appropriately jaded journalist. Indeed, the scenes involving his intrigues are particularly compelling. Conversely, the priest played by Viktor Shamirov never feels like a fully flesh-and-blood character. Thaw or no thaw, there was still a climate of fear in 1956 Russia, which is nice reflected on screen. F ather and son cinematographers Gennady and Alexander Karyuk capture both the bleakness of Zoya’s industrial backwater village as well as the ominously austere buildings housing the Party bureaucracies. While much of Miracle is allegorical, Proshkin keeps the drama tightly focused and well grounded the realities of Khrushchev-era Russia. Echoing Arthur Koestler, Miracle shows the failure of the god of Communism, as well as the shortcomings of human nature in general. It is a challenging film that deserves an international audience. An excellent representative of Russian cinema, Miracle screens again today (11/15) and next Sunday (11/22) at the Millennium Theater in Brighton Beach. “A great Russian brand” is how director Sergei Solovyev described Leo Tolstoy in a press conference held last night. He also credited Oprah Winfrey for helping bring his screen adaptation of Anna Karenina to fruition when she recommended it to her Pavlovian viewers, making an unlikely bestseller of the Nineteenth Century novel. While Solovyev might have departed stylistically from earlier film treatments, rest assured he did not “Oprah-ize” his big screen version of Tolstoy’s Anna Karenina (trailer here), which opened this year’s Russian Film Week in New York City. Karenina is a rich, complex, and lengthy novel, but it can be readily boiled down to its essence. Anna Arkadyevna Karenina is married to the much older Alexei Alexandrovna Karenin, but she is the lover of the dashing Count Alexei Kirillovich Vronsky. Their situation produces conflict that is timeless and universal. Most prior adaptations of Karenina have been formal costumes dramas, very conscious of their status as prestige pictures. While the sets and costumes are appropriately elegant, Solovyev’s approach is much more impressionistic, employing saturated colors and deliberately cinematic lighting effects. Likewise, composer Anna Solovyeva’s score also reflects a great variety of moods and textures, but it always nicely fits the on-screen drama. Considering they are playing two of the greatest lovers in the history of literature, Tatyana Drubich and Yaroslav Boyko seem like surprisingly cold fish as Anna Karenina and Count Vronsky, respectively. Strangely, it is the old men who fare best in Soloyev’s Karenina, with Oleg Yankovskiy bringing unusual dignity and gravitas to the role of Karenin, the often overlooked side of this classi c love triangle. Sergey Garmash, known for playing heavies in Nikita Mikhalkov’s 12 and Anders Banke’s Tribeca-selected Newsmakers, is also quite effective, but almost unrecognizable, as Kostya Levin, the spurned suitor of Anna’s youngest sister-in-law, Kitty. While Solovyev brings a distinctive new look to the material, Karenina still has plenty of good old-fashioned literary melodrama to offer. Non-Russian speakers should note one particular caveat though. The distractingly bad subtitles are often completely illegible against white backgrounds (and it snows a lot in Russia). It might not be the best Karenina yet filmed, but it is certainly an apt way to kick-off Russian Film Week. Solovyev’s Karenina screens again Monday (11/16) at the SVA Theatre. In mathematics, six is the smallest perfect number, making it an appropriate designation for the unnamed protagonist of The Prisoner, Patrick McGoohan’s cult 1960’s science fiction series. While the original Number 6 was a paragon of individuality, times have changed. In AMC’s three-night six-hour miniseries reboot, Number 6 now desperately clings to his sense of self in the face of a technological dystopia. Yet, Prisoner fans will be happy to hear Number 6’s mantra remains the same: “I am not a number, I am a free man.” They will have plenty more to compare, contrast, and debate when The Prisoner (trailer here) debuts this coming Sunday night. A man wakes up in the middle of the desert. Though disoriented, he still rushes to help an elderly man fleeing an armed gang. Following the dying man’s instructions, he makes his way to the nearest settlement, a community of largely homogenous pre-fab buildings referred to simply as “The Village.” There are no names in The Village. Everyone is known only by their number. (According to the press kit, mine is 779). The reluctant new arrival is told he is and always has been Number 6, by Number 2, the supposedly benevolent ruler of this ostensibly happy community. We quickly learn from early flashbacks the new Number 6 at least has a first name, Michael. We also know he recently resigned from a sensitive position at an electronic surveillance firm, but the true nature and location of The Village remains a mystery. As in the original series, Number 2 will wage a not-so cold war to break 6 of his headstrong individuality and convince him to accept life in The Village. Pulling out all the stops, 2 targets 6’s human vulnerabilities, like familial love and romantic attraction. Yet unlike the original 6, who tormented a rotating cast of 2’s with his brilliant counter-measures, the new 6 constantly struggles to maintain his sanity in the face of this 2’s relentless psychological warfare. Of course, should 6 ever try to make a break for it, Rover, the ominous beach ball, is still there to herd him back to the tight little Village. Though many of the particulars have changed (like the desert setting in place of the vaguely Mediterranean ambiance of the original Village), AMC’s Prisoner often nods to the classic series, with strategically placed props, including an antique penny-farthing bicycle and a lava lamp. Writer Bill Gallagher also demonstrates a similar flare for eccentric details, like the Village cuisine, which is now consists almost exclusively of wraps (except for the cakes baked for 2, of course). The new Prisoner also delves deeper into the sociology of The Village, where surveillance is one of the subjects taught in grade school and matches are made through blink counts. While AMC’s Prisoner is divided into six episodes (each with a title that echoes those of the original series), it is very definitely a sequential narrative that steadily builds towards its final reveal. 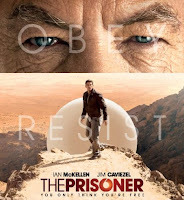 Unlike the 1960’s show, the new incarnation of The Prisoner is much more cinematic, capitalizing on the sweeping sand dunes and sun-drenched vistas of its desert locale. In fact, Florian Hoffmeister’s lensing nicely reflects the surreal nature of the Village (wherever it might be), suggesting he might be the right cinematographer to shoot the next Dune adaptation as well. In most respects, the new Prisoner gets the tone and spirit of the otherworldly Village right. However, the evil Summakor Corp. seems like small beer compared to the shadowy forces behind the original Village, which might have been run by our side, the other side, or both sides coopera tively in an early manifestation of New World Order paranoia. Still, AMC’s Prisoner makes up for the evil corporation cliché with a series of increasingly inventive revelations that should even pass muster with the generation of viewers raised on The Matrix. Indeed, this Prisoner is a very cleverly constructed science fiction event that will definitely entertain newcomers to the Village and satisfy most cult followers of the original Number 6. It is commendably ambitious, requiring a certain commitment of time and attention, given its fractured narrative and the frequently dubious nature of reality within its story. The Prisoner debuts on AMC this Sunday (11/15), continuing through Tuesday (11/17), with two back-to-back episodes each evening (8:00 PM EST). It seems like a safe guess Minos Papas has seen Blow-Up a time or two. Even if he was unfamiliar with the Michelangelo Antonioni classic before he started filming his own feature about a professional photographer’s trippy experiences and bizarre visions, he has surely heard numerous references since then. Of course, Papas is not Antonioni, but at least he displays a notable visual sensibility in Shutterbug (trailer here), which premiered at this year’s New York Greek Film Festival. Alex is an obsessive photographer who will do anything for a shot, including looking into the sun, which obviously you should not do (particularly if your livelihood depends on your vision.). At first, he just has a case of those persistent spots, but soon he begins having ghostly visions of a woman he does not recognize. Getting little help from an optometrist, Alex wanders into a storefront psychic’s reading room. She is not much help either, but refers him to a heavy-duty spiritualist who lives in a sketchy area around the Williamsburg Bridge. In what are undeniably the strongest sequences of the film, Papas creates a haunted netherworld of lost souls (metaphorically) under the bridge. With his eyes literally playing tricks on him, Alex’s journey through that strange night is thoroughly disorienting and at times harrowing, quite impressively lit, shot and cut by Papas and his crew. Unfortunately, the cause-and-effect plot points getting him there make no sense whatsoever. 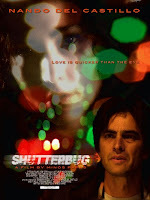 There is really no logic to be found in Shutterbug. Based on the events of the film, it is hard to even say you should not look directly into the sun (but truthfully, you really shouldn’t). Still, it is an interes ting looking film, courtesy of d.p. Rossana Rizzo’s often hallucinatory lensing. Shutterbug also gets a strong assist from the Tao Zervas’s very Brooklyn sounding soundtrack. Unfortunately, it is undone at key moments by some visual effects that betray Shutterbug’s limited budget. At times, Shutterbug really makes New York look new and strange. It also leaves audiences scratching their heads in bewilderment. Still, Papas clearly has a talented eye and a lot of potential as a filmmaker. Shutterbug has its merits and should be a portent of things to come. One of the scarier aspects of Stalin’s reign of terror was the effectiveness of his cult of personality. His image was omnipresent, investing his iron-fisted rule with a secular idolatry which brooked no criticism. (Thankfully, nothing like that could ever happen here, right?) In fact, reverence for his personality cult was so deeply ingrained in the Soviet people, many of those who suffered personal persecution under his regime reportedly still wept when news of Stalin’s death was released to the public. That emotional dichotomy is sensitively dramatized in Rustem Abdrashev’s The Gift to Stalin (trailer here), which screens as part of the 2009 Russian Film Week. Under Stalinism, Kazakhstan became the dumping ground for massive deportations of Soviet ethnic minorities (including a surprisingly large Korean community). As Gift opens in 1949, young Sashka’s Jewish family is on one such cramped transport making its way through the Eurasian steppe, in a scene that bears an obvious similarity to tragic events from Europe’s recent history. The train stops at each provincial station just long enough to unload the freshly deceased, but it is sufficient time for Sashka’s family to smuggle him off the train in the company of corpses, where he is discovered and essentially adopted by Kasym, a fierce looking, but gentle track worker. Given the risks inherent in sheltering Sashka, the Muslim Kasym has the village spiritualist rename him something less suspicious and more Kazakh sounding: Sabyr, meaning humble. Though still physically powerful, Kasym is old enough to be the boy’s grand-father, so he gets welcome help from his neighbor Verka, the exiled widow of an alleged traitor. Unfortunately, the village cannot openly come together to raise Sashka/Sabyr. Even on the lonely steppe, the Party apparatus, represented by a venal policeman and the sadistic regional military commander, maintain the Stalinist atmosphere of fear. When not victimizing the local women, the party leaders are preparing the town’s commemoration of Stalin’s big seven-o. Gifts from children across the USSR are being collected for the nationwide birthday celebration. The child offering the best sacrifice wins the privilege of giving their gift to Stalin personally. It might sound like a questionable honor, but Sashka covets it as an opportunity to petition Stalin for the release of his parents. However, the gift Stalin really wanted was the first successful Soviet test of an atomic bomb, which will soon literally rock Kazkhstan. Abdrashev dramatically employs the vastness of the steppe to express the alienation of his exiled characters and deftly handles his many young actors. The physically imposing Nurjuman Ikhtimba yev turns in a legitimately touching performance as Kasym, the gentle giant. Dalen Shintemirov comes across quite naturally on-screen, neither cloying nor affected in the role of young Sashka. Told in flashbacks by an adult Sashka now safely residing in Israel, Gift is an unabashedly sentimental story of sacrifice and thanksgiving, but honestly earns its emotional pay-off. To its credit, the film does not whitewash the realities of life under Stalinism, particularly regarding ethnic minorities banished to the Eurasian republics. One of the best films of this year’s New York Jewish Film Festival, Gift makes a welcome return to the City under the auspices of Russian Film Week. It screens Tuesday (11/17) at the Brooklyn Public Library and next Sunday (11/22) at the Millennium Theater in Brighton Beach. For three characters, the unwelcoming urban environment of Taipei is hardly conducive for forging human connections. Their director ought to know. He was a stranger there himself. Born to an ethnic Chinese family in Malaysia, Tsai Ming-liang became the leading director associated with Taiwanese cinema’s “Second New Wave.” That sense of otherness informs much of Tsai’s work, especially his international breakout film, Vive L’Amour, which screens this coming Tuesday at the Asia Society as part of their Faces of Tsai Ming-liang retrospective. They never talk much, which is a little ironic since they all work in sales, to some extent. May Lin is a real estate broker, who uses the half furnished apartment she is showing for a one night stand with Ah-jung, a common street vendor. Unbeknownst to her, Hsiao-kang has been secretly squatting there. A traveling funeral urn salesman, Hsiao-kang is a sexually ambiguous, suicidal mess. Hiding under beds and tiptoeing around the apartment to avoid detection, Hsiao-kang’s near misses would be the stuff of screwball comedy in a different film. In Vive though, they are emblematic of his desperation and alienation. Make no mistake, this is not a funny movie. It is about lonely people, whose lives are emptier than the apartment they sort of share. Uncompromising in the extreme, Tsai largely eschews dialogue throughout Vive. Yet his style remains unyieldingly intimate. There are many wincingly uncomfortably moments throughout the film, but the simplicity and directness of its conclusion perfectly expresses the film’s underlying despair. It truly is the work of a demanding auteur. Vive’s “roommates,” Lin, Ah-jung, and Hsiao-kang, are played by three frequent Tsai collaborators: Yang Kuei-Mei, Chen Chao- jung, and Lee Kang-sheng, respectively. While Lee gets most of the showy scenes of cross-dressing and an attempted suicide, it is Yang who really lowers the film’s emotional boom. Her haunting work makes the film unforgettable. About as far from multiplex-popcorn fare as cinema can get while still maintaining a linear sense of plot, Vive is definitely for discriminating cineastes. Yet once viewers acclimate to its deliberate pace, it delivers a real emotional punch. Currently unavailable on DVD, its November 17th screening at the Asia Society offers a rare opportunity to see it on a big screen. The Faces series starts Friday (11/13) and runs through Saturday (11/21), with a free screening of Tsai’s latest film, Face, scheduled for Sunday (11/15).